The Black Feather Stubs are a sure way to recognise a real Bronze Turkey. There is no need to remove them, they just shrivel during cooking. A very large bronze turkey over 19lbs, long slow cooking is the best, but do remember to cover the legs before you place your Goodman's free range bronze turkey into the oven. Do not forget to fill the cavity of the bronze turkey with chopped onions, apples and thyme or parsley or some mixed herbs of your choice. This helps to keep the bronze turkey moist. A sausage meat stuffing is also very good. Do not forget to either pour some melted goose fat or butter, or a few pieces of bacon over the legs of the bronze turkey to keep them moist and cover them with a triangular piece of foil. Line your roasting tin with foil. 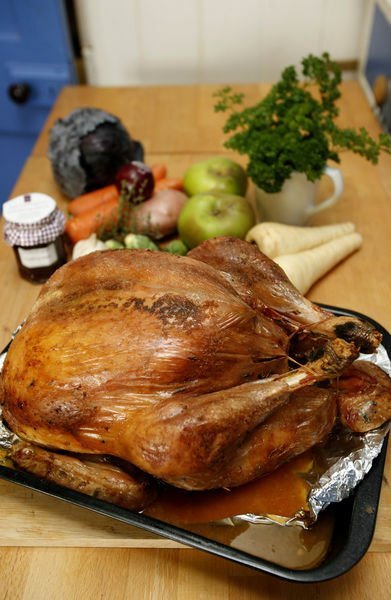 Then place the bronze turkey into the meat tin and cover the breast of the bronze turkey with either melted goose fat, butter or some rashers of bacon and cover with salt and pepper. If your oven is very hot place a piece of foil over the breast of the bronze turkey to stop it burning. If after the first hour, you want to turn your bronze turkey over, do it just like the goose. It makes it easier if you have two meat tins and do not forget to cover the legs with foil and pour some of the liquid fat over the back of the bronze turkey to help to keep it moist. A very large turkey it is better to cook it breast side up. If it is a 4.5 - 5.5kg bronze turkey turn back after the second hour. Baste again keep the legs covered and cook for another 1/2 to 1 hour depending on the size of your bronze turkey. When you take the bronze turkey out of the oven, leave to stand for at least 15 - 20 minutes so that the meat rests making carving so much easier.